← Does this make us cool? Joel, guitar – and sitar- hero from Sunday Driver turned thirty at the end of October. We’re turning the upcoming gig at Cafe de Paris (Friday 13th November – be there!) into a sort of birthday party for him. ‘Cos we’re nice like that. I decided to try out a new technique on this cake – brush embroidery. 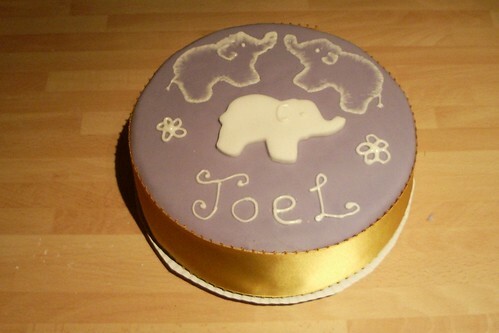 That’s the two elephants on the top of the cake. The one is the middle is just made of sugarpaste, to hide an unfortunate dent in the top. I was a bit rushed for time and I’m avoiding writing my infamous NaNoWriMo novel, so it’s not as neat as it could be. And in retrospect I don’t think I should have done the freehand flowers – brush embroidery ones would have fitted better.